Quinoa (keen-wa) is a seed that is used like a grain. If its package does not say it is pre-soaked and rinsed, soak it for 15 minutes in water and then drain through a coffee filter or cheesecloth in a colander. This removes a bitter flavor. Quinoa can be substituted in most recipes for rice, couscous or pasta. 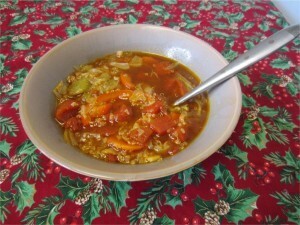 Prepare A Harvest of Quinoa Soup the day before to enhance the flavors. Heat non-stick Dutch oven over moderately high heat. When hot, add the oil. Sauté the quinoa, carrot, celery, onion, bell pepper and garlic in oil until golden brown. Add broth, tomatoes and cabbage and bring to a boil. Simmer 30 minutes or until vegetables are tender.